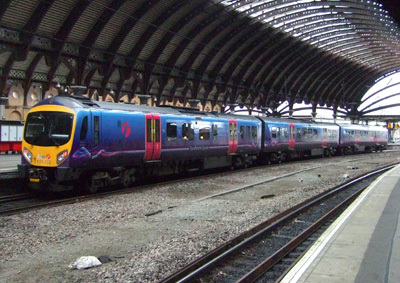 Class 185 Pennine is a class off Diesel Multiple Units (DMU's) that were built in Germany by Siemens for the train operating company First TransPennine Express. In total 51 train sets were built in 2005 - 2006. Each train sets consists of three cars with a total of 169 seats (154 standard class and 15 first class). Each car is 71.276 m (233.85 ft) in length and constructed of aluminium. All cars are individually powered by a 560 kW (750 hp) diesel engine, but the train can run in eco mode, when only two of the three engines are used, on flat sections of track. All trains are air-conditioned and offer space for two bicycles, wheelchair space and a reduced mobility access toilet.